One of my favorite features of the stats program I use is the bar graph map of the planet that tells me from what time zone a person is viewing this blog. According to said bar graph, most of the people reading are from the Central Standard Time zone (where I live; six hours behind London). There may be some glitches in this feature, because in the four months I have been using the stats program, I have apparently never had a reader from Australia. But I can't be bothered to worry about them right now. No, this post is a shout-out to all the people living in time zone X. The stats program breaks down time zones by letters of the alphabet. I live in time zone E, Britain is located in time zone K, and way over there on the right side of my map is time zone X -- it appears to cover New Zealand, Fiji, the Marshall Islands, and Kamchatka. Kamchatka, as we all know, is one of the most difficult positions to hold in the board game Risk, but its possessor is almost always ensured a win. The Marshall Islands are where my grandfather was stationed during World War II. The U.S. stationed a large fleet there anticipating Japanese attack, but the attack never came. As a result, it was boring as hell. My grandfather was a morale officer -- he spent the war encouraging people to play baseball or read magazines. 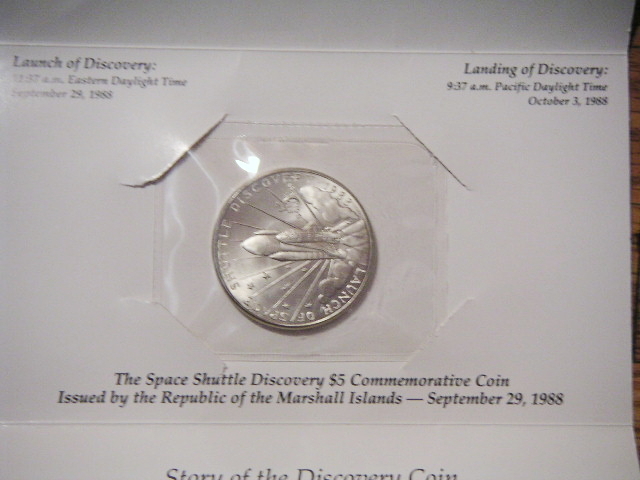 The Marshall Islands is also where my $5 Space Shuttle Discovery Commemorative Coin was minted. It honors Sept. 29, 1988, when "Space Shuttle Discovery gracefully lifted into a warm Florida sky, bearing with it a nation's hopes and dreams." I excitedly bought this coin for both sets of grandparents and myself that Christmas. Here's a picture of my beloved coin*. There aren't a lot of people from time zone X reading this blog; there have been only 28 hits from them this month. But I think that's enough to assume that they aren't all accidental readers. Perhaps most people in that time zone are busy minting commemorative coins, amassing forces in preparation for an invasion of Alaska, blasted on kava, or trying to pick a fight with Russell Crowe. For those of you that are reading, however. Thanks. *Strangely, in the same box that I found my commemorative coin, I also found my Portsmouth Student Union membership card, my first driver's license, a coin from the former Soviet Union and a wallet-sized picture of Sarah McDaniels and me at homecoming. The only people to have ever heard of Kamchatka are those that live there, maybe their immediate neighbours and Risk players and thats it. I've heard Kamchatka mentioned on the news a couple of times. The first thing i think of is the risk board. I wonder if the country itself knows that as far as the world is concerned they have all the status of the last square on the Monopoly board (Mayfair).